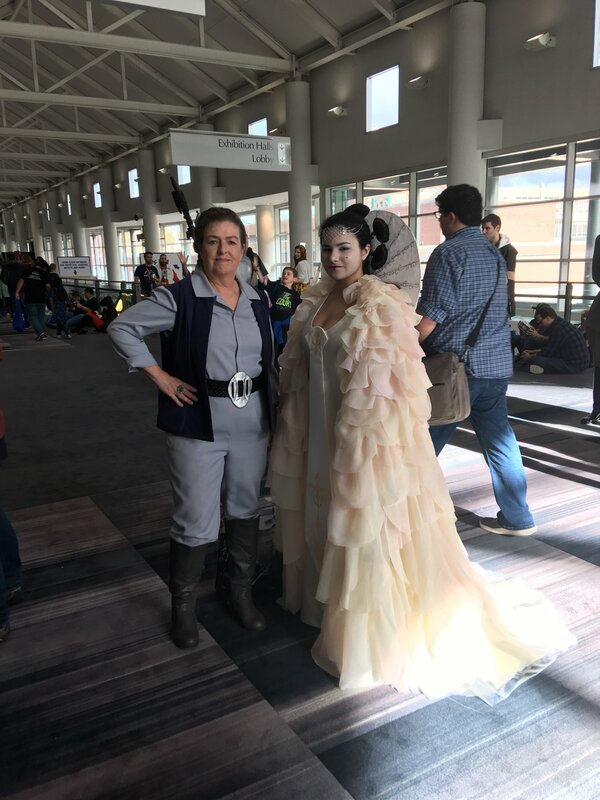 I'm actually looking into creating this gown myself for RL submission, and I'm a bit stumped on how to make the jewelry piece that sits against Amidala's forehead. Any and all tips would be appreciated. 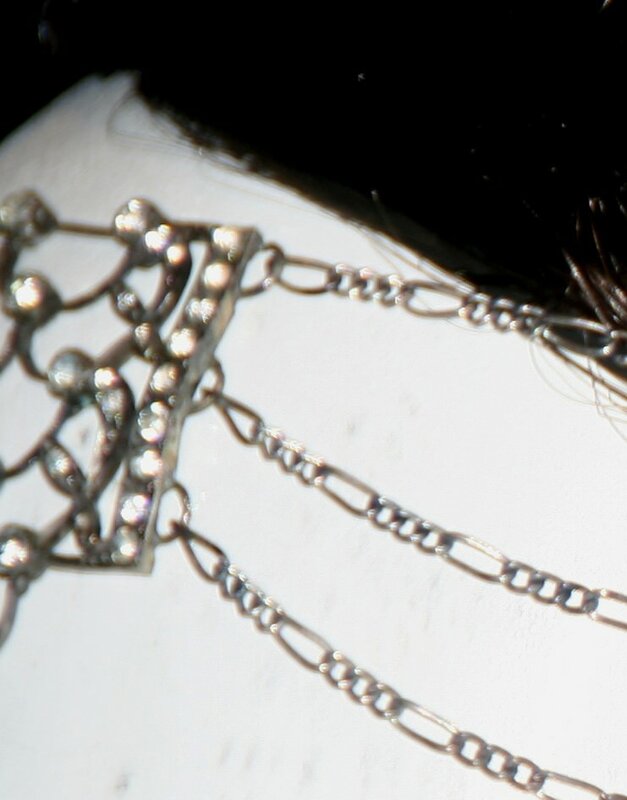 The only thing I would change if I were to buy it are the side chains, as the originals are figaro chains. Best of luck on your build, if you have any other questions/progress updates I'd love to hear about it! I don't know how much hair we are talking about, but I think it sounds like you need to incorporate it into the buns themselves. Maybe some of them can be premade and you'll just use your own hair of the couple of them. (Matching the fake hair will be important). The end of your hair would be wrapped around the base and help secure the whole thing. And this is probably a terrible description, so maybe it doesn't help you much. How much hair do you have? Length, thickness? 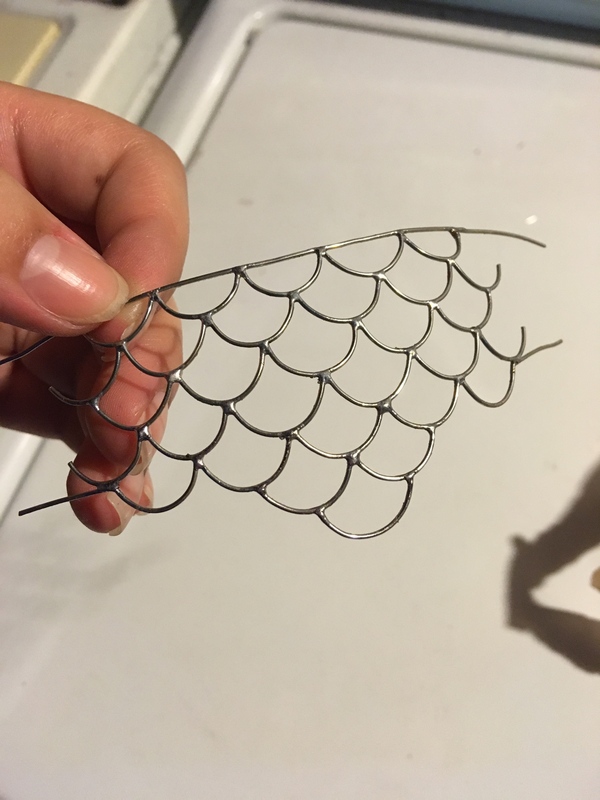 The headband you should be able to make from thin wire twisted together. The hard part will be to ensure even spaces. Actually, I think wrapping my hair around the base of the structure might be a good idea. Since I can't fit all of my hair in the bun cover for the ponytail clip, I'm thinking about splitting half of my hair in a bun and the other half I'll leave out until I pin the structure on, then I'll wrap it around the base. It probably won't be visible since the six little buns stick away from the base, so as long as I keep my hair wrapped close to the base I should be good. I have thick hair that reaches a few inches past my waist when it's straightened. 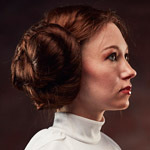 I really want to avoid having to do my hair every single time - I do this for my Leia buns and that's as far as I'll go, lol! However, I did make some progress on my headpiece! This was my first time soldering something together - I had tried a few weeks ago, but I was soldering incorrectly, and luckily someone graciously helped point me in the right direction. I just need to add the side pieces, the jewels, and the chains! For the side pieces, which are really unique, I was thinking of just sculpting them out of clay. I'm not really sure how to go about these little parts besides that. Good luck. Your progress is looking good. Soooo, it's been a month, and unfortunately, classes have consumed most of my time. 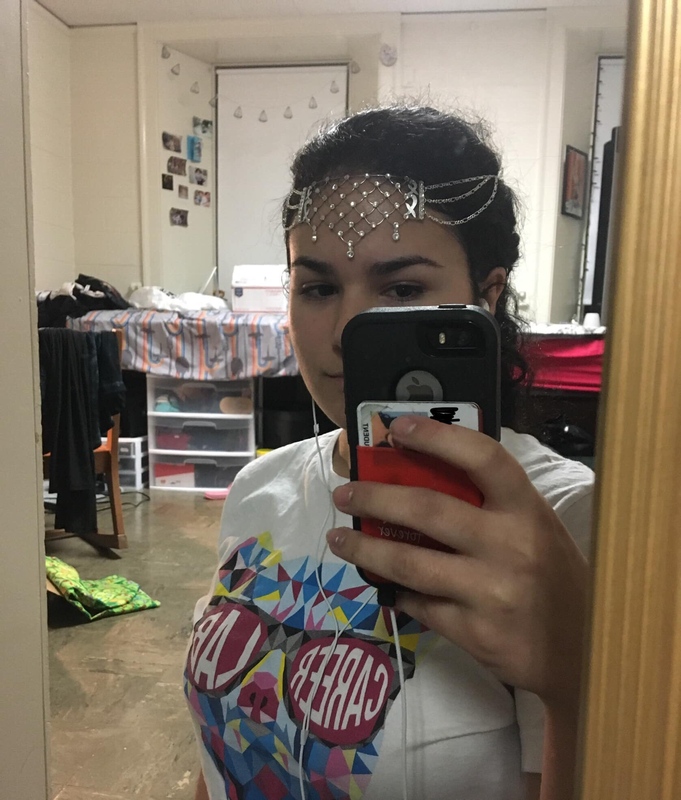 However, this weekend I made the finishing touches on my forehead jewelry, and it's completely wearable now! This was my first time soldering metal together and making any sort of jewelry piece. It took a lot of time and patience to get the right cuts and shape, especially on those little side flower pieces, but overall I am really pleased with the outcome! Have you considered using a harness to wear the parasol? The straps would go under the cape and the petals would disguise where they are . I was able to finish my costume for a convention last weekend. I'm really pleased with my sewing work, my hairpiece, and my jewelry piece. 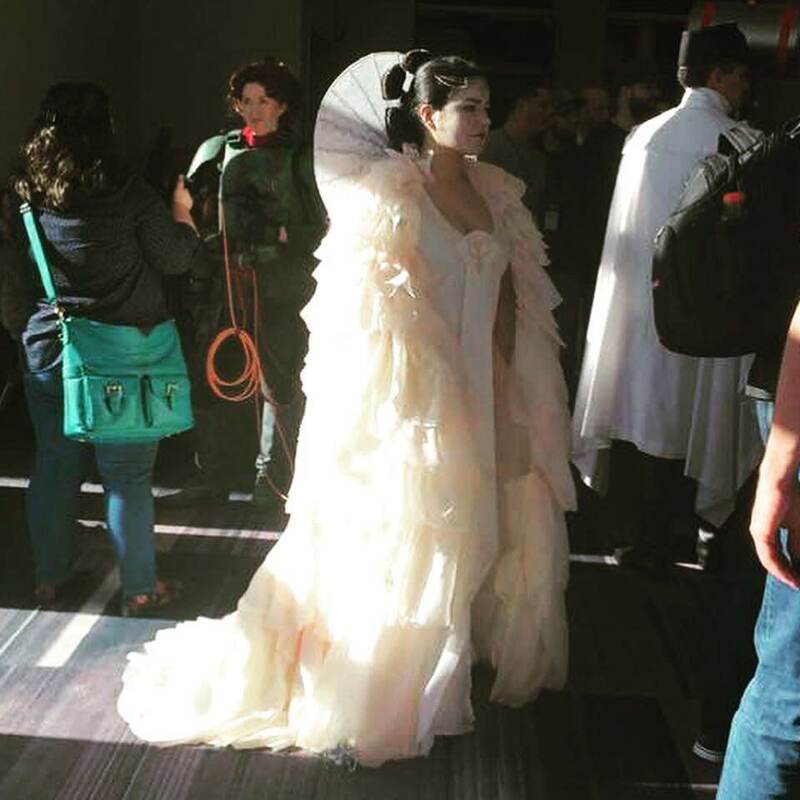 However, I considered this to be a test run wear, as I plan on remaking my parasol before I submit for RL. 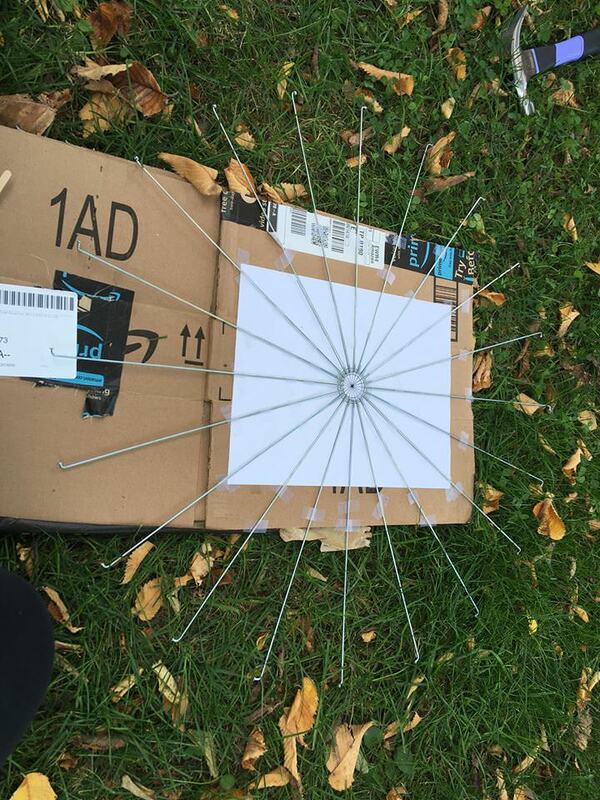 I thought my calculations for the parasol were correct, but I was wrong - it was too small in the end... which is really frustrating considering I had even cut down the spokes to get the finished size! 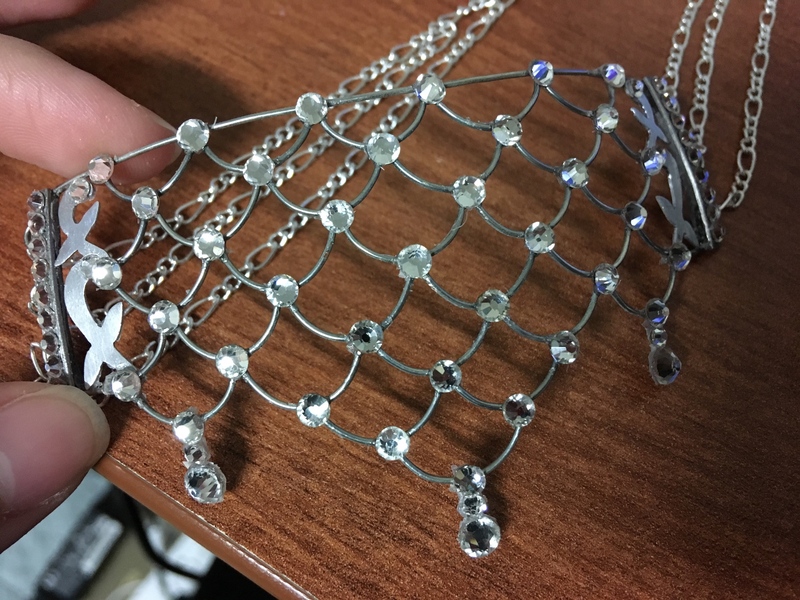 And a picture of my jewelry piece that I soldered! That's a great idea, actually. I ended up using two small bar hooks, but it wasn't enough. I had to sew the parasol down for the day, but I'm looking at other options to keep it on (and in place so it doesn't twirl around). I think both hooks/snaps and a harness would be ideal. Either way, I've been trying to rethink the construction of the parasol. 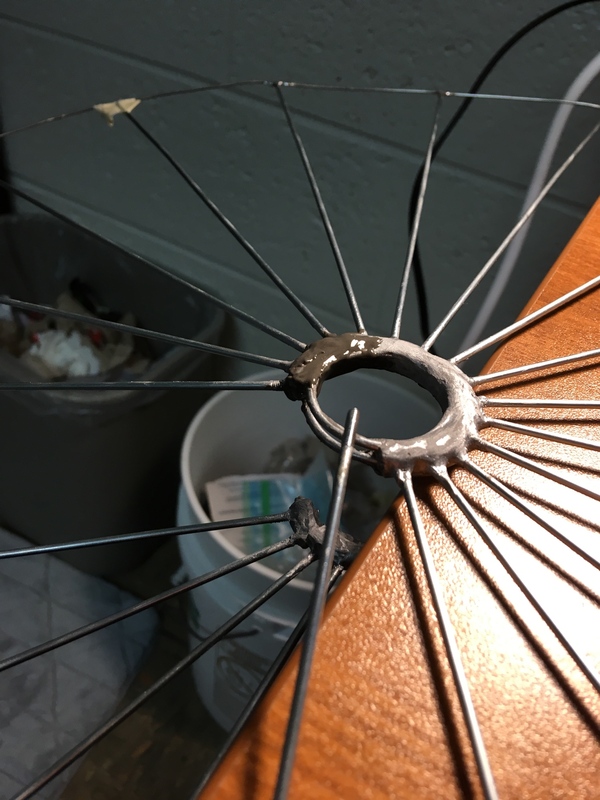 I used JB Weld to hold the center circle and spokes together, but it broke when I was trying to bend the spokes backward to give the parasol the bent shape it has. I think this flexibility is ideal for traveling purposes and wearing purposes, since I'd be able to pack it flat for traveling, but when I wear it, it could bend backward. If I used JB Weld for my next parasol, I won't be able to acheive this since JB Weld pretty much locks it in place. Any thoughts? Additionally, I've been having a rough time with the metal ends on the parasol. I was going to make resin casts, but hasn't been working out! I tried a one part mold, but the mold was not being filled when I poured the resin in. I made a funnel at the top of the mold so the liquid plastic can go down the funnel and fill the mold, but it only wants to fill the funnel and for some reason won't go down into the mold. I thought that the fact that it was a one part mold was the cause for this, so I went ahead and tried making a two part mold, as seen below. The same issue is hapenning where the liquid plastic will not go down the funnel and into the mold... it just fills the funnel. My master is boxed in green, and the funnels the got cast are boxed in black. Everything else is the casts that were incomplete! In the mean time, I'm going to try to solve this so I can go ahead and cast these. 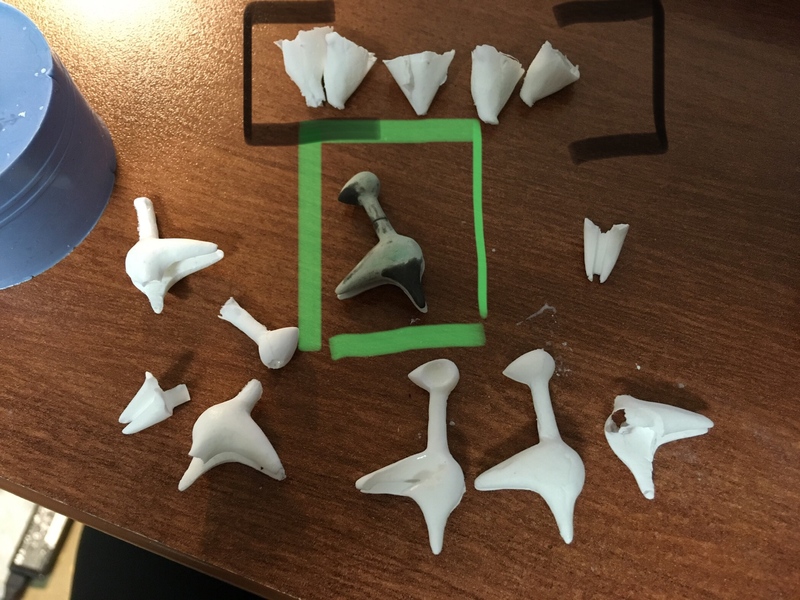 I just need to figure out why it hasn't been casting correctly. I think you're right about the oval shape. Even if it was bent in that photo, a perfectly circular parasol would look short and wide, rather than tall and thin. I wonder if 3D printing could be an option for the tips. I'm not sure if I have seen any print files of those yet though. As to the flexibility, maybe it's just a different type of metal that is more cooperative to being bent, some kind of thick memory wire? Regardless of the parasol being too small, your costume still looks lovely. Alas, I don't have any advice for the flexible parasol, but I do think you're right about the slight oval shape as opposed to a perfect circle. For the casting, did you have a small air hole at the other end of your mold? The air inside will need a place to go as you start filing it. That might be your problem. And of course, you'll need to make sure it get into every cranny as you go. Exactly! Also, traveling with this was really stressful... and it's only going to be a bigger issue now that I'm making it larger and adding the tips!! I think someone in the Padme facebook group had started a 3D print file for it! Honestly, I know nothing about 3D printing though, and am probably better off the route I'm going since it took me so long to sculpt the master! Hmm, that's an interesting observation about the memory wire. 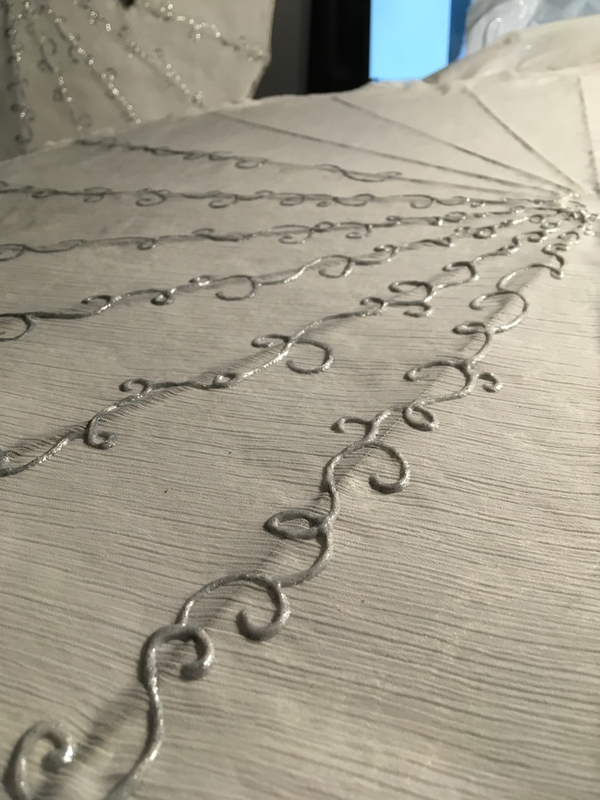 I literally don't know what could've been used, especially considering there is fabric sandwiching the wire layer - I am worried that my fabric will wrinkle/stretch in some areas after bending and straightening the frame too many times. I'm still considering my options though. I might have to look for a material that is flexible yet adhesive... and maybe have a wire ring in its core for extra support. Thank you! 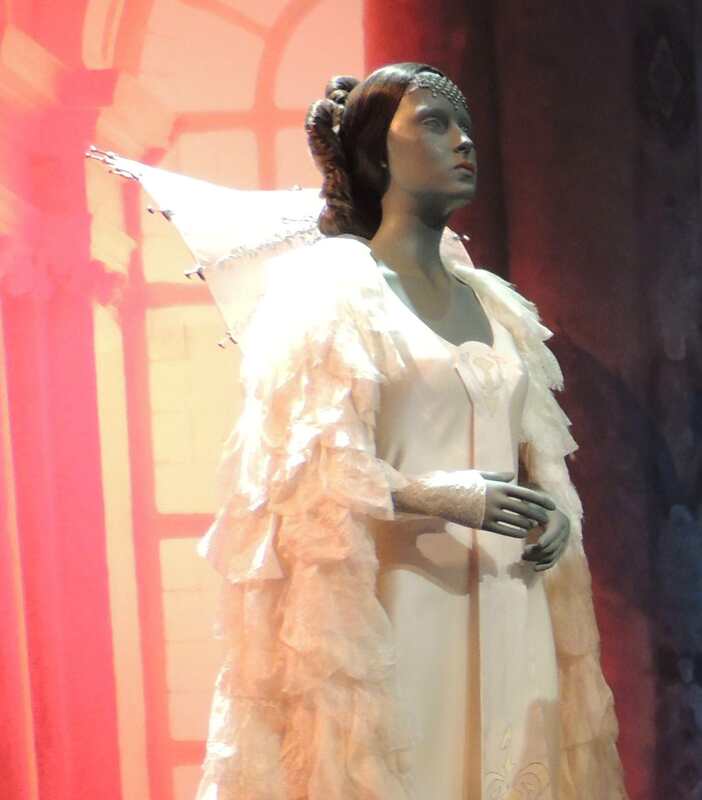 For being one of the Queen's "easiest" costumes, it was still a huge challenge. And ah - that might be where my problem is, not letting the air come out. Especially since the piece is so small, and is difficult to fill because of the weird forked piece at the bottom. I'm going to attempt to make a new mold with a vent, hopefully that will work. Thanks for the tip! You've done an absolutely stunning job so far! Well done! Good luck with it. I haven't cast anything myself, but I know from others that your cast won't succeed if the air is stuck inside. Better to have small areas to break off and sand down afterwards. Hello! It's been quite a while, but I've made some progress! 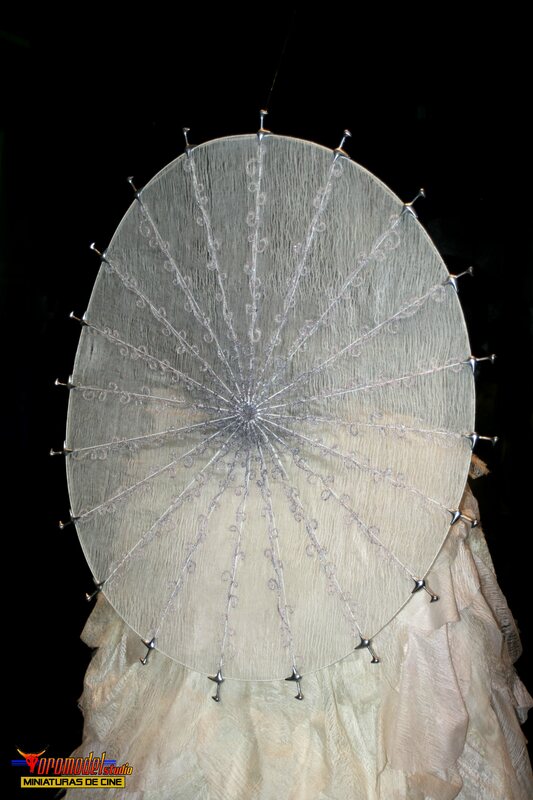 I've been working on remaking my parasol, and I'm almost done! I had attempted to make a new mold with vents buuuutt of course, my bottle of silicone dried, RIP. 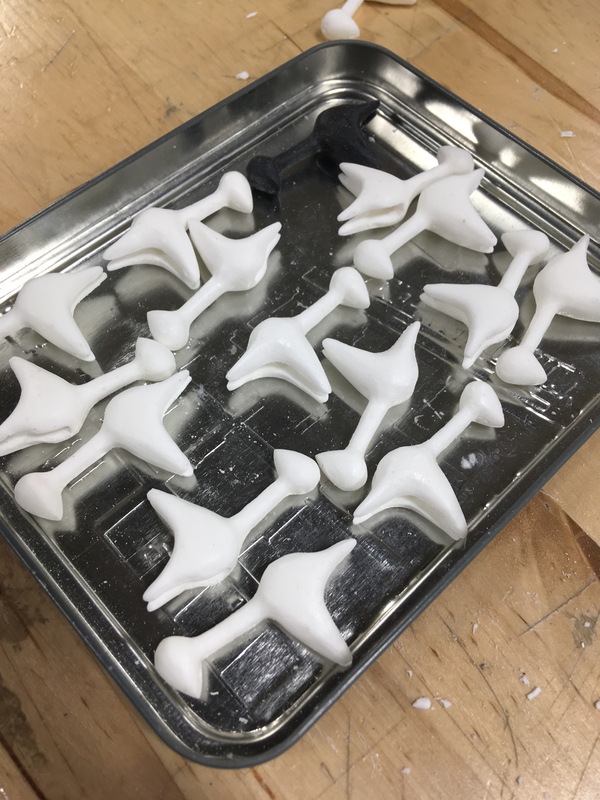 However, someone from my garrison was able to help me take a mold of the tips - even they said it took them a few tries to get it right! 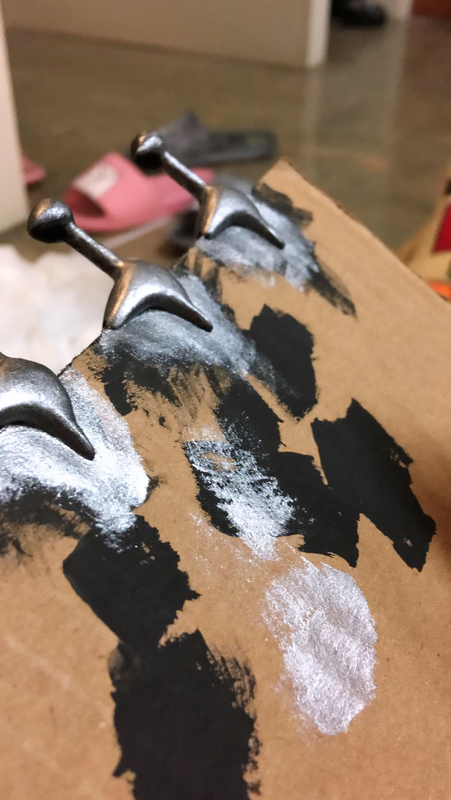 I was able to cast them and file them down, and here are some pictures! In the meantime, I'm still trying to figure out how to attach the parasol. 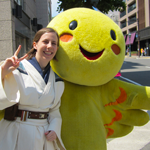 With my old parasol, I'd tried using two hooks but it HARDLY held, so I had to sew it in the day I wore it. 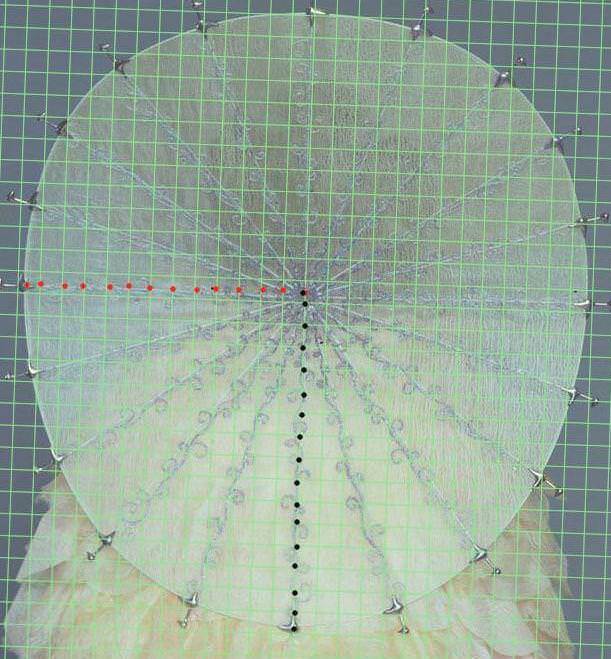 This time, I'm going to try to figure out a harness - but I'm still wondering how to attach it on the parasol side. 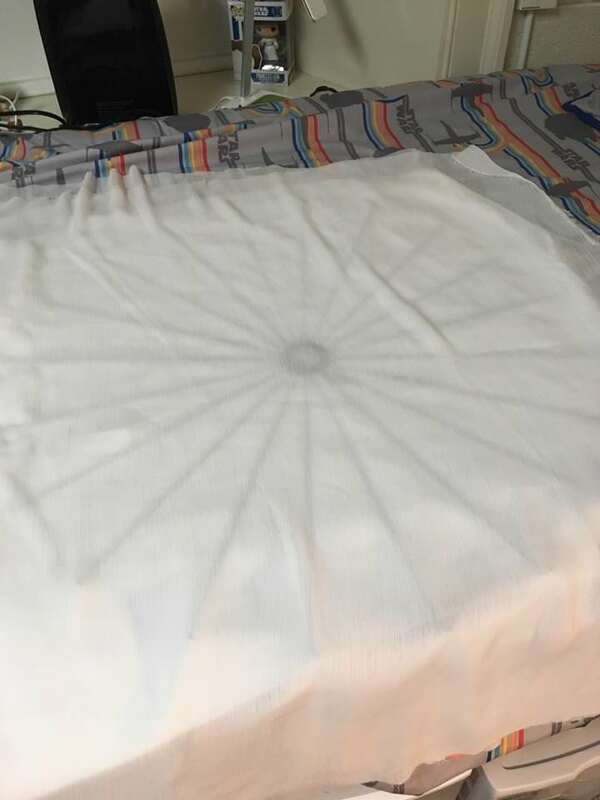 I only used 2 layers of fabric on the parasol this time (last time I used four, and it was definitely too much), and I'm worried that the layers are too thin to attach a harness without it being visible from the other side. Any thoughts?